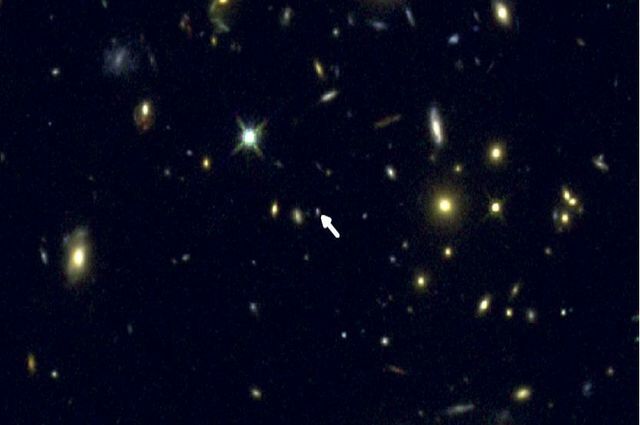 UCLA astronomy graduate student Ryan Sanders discovered a way to precisely measure oxygen in distant galaxies like COSMOS-1908, indicated by the arrow. COSMOS-1908, contains approximately 1 billion stars. In contrast, the Milky Way contains approximately 100 billion stars; some galaxies in the universe contain many more, while others contain many fewer. Furthermore, COSMOS-1908 contains approximately only 20 percent the abundance of oxygen that is observed in the sun. 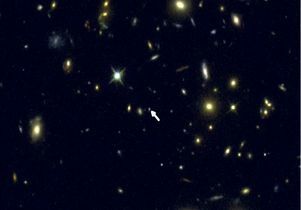 Typically, astronomers rely on extremely indirect and imprecise techniques for estimating oxygen abundance for the vast majority of distant galaxies. But in this case, UCLA researchers used a direct measurement, said Ryan Sanders, astronomy graduate student and the study’s lead author. “Close galaxies are much brighter, and we have a very good method of determining the amount of oxygen in nearby galaxies,” Sanders said. In faint, distant galaxies, the task is dramatically more difficult, but COSMOS-1908 was one case for which Sanders was able to apply the “robust” method commonly applied to nearby galaxies. “We hope this will be the first of many,” he said. Shapley said that prior to Sanders’ discovery researchers didn’t know if they could measure how much oxygen there was in these distant galaxies. “Ryan’s discovery shows we can measure the oxygen and compare these observations with models of how galaxies form and what their history of star formation is,” Shapley said. The amount of oxygen in a galaxy is determined primarily by three factors: how much oxygen comes from large stars that end their lives violently in supernova explosions — a ubiquitous phenomenon in the early universe, when the rate of stellar births was dramatically higher than the rate in the universe today; how much of that oxygen gets ejected from the galaxy by so-called “super winds,” which propel oxygen and other interstellar gases out of galaxies at hundreds of thousands of miles per hour; and how much pristine gas enters the galaxy from the intergalactic medium, which doesn’t contain much oxygen. “If we can measure how much oxygen is in a galaxy, it will tell us about all these processes,” said Shapley, who, along with Sanders, is interested in learning how galaxies form and evolve, why galaxies have different structures, and how galaxies exchange material with their intergalactic environments. Shapley expects the measurements of oxygen will reveal that super winds are very important in how galaxies evolved. “Measuring the oxygen content of galaxies over cosmic time is one of the key methods we have for understanding how galaxies grow, as well as how they spew out gas into the intergalactic medium,” she said. The researchers used an extremely advanced and sophisticated instrument called MOSFIRE (Multi-Object Spectrometer for Infra-Red Exploration) installed on the Keck I telescope at the Keck Observatory. This five-ton instrument was designed to study the most distant, faintest galaxies, said UCLA physics and astronomy professor Ian McLean, project leader on MOSFIRE and director of UCLA’s Infrared Laboratory for Astrophysics. McLean built the instrument with colleagues from UCLA, the California Institute of Technology and UC Santa Cruz and industrial sub-contractors. MOSFIRE collects visible-light photons from objects billions of light years away whose wavelengths have been stretched or “redshifted” to the infrared by the expansion of the universe. Due to the finite speed of light, MOSFIRE is providing a view of these galaxies as they existed billions of years ago, when the light first started traveling to Earth. MOSFIRE is a type of instrument known as a “spectrograph,” which spreads the light from astronomical objects out into a spectrum of separate wavelengths (colors), indicating the specific amount of energy emitted at each wavelength. Spectrographs enable astronomers to determine the chemical contents of galaxies, because different chemical elements — such as oxygen, carbon, iron or hydrogen — each provide a unique spectral fingerprint, emitting light at specific wavelengths. Data for COSMOS-1908 were collected as part of the MOSFIRE Deep Evolution Field (MOSDEF) survey, a large Keck Observatory project that Shapley and Sanders have carried out in collaboration with astronomers at UC Berkeley, UC Riverside and UCSD. Between 2012 and 2016, the MOSDEF survey was allocated roughly 50 nights of MOSFIRE time on the Keck I telescope to study distant galaxies forming in the early universe. The research was funded by both the National Science Foundation and NASA. MOSFIRE was also funded by the National Science Foundation (through the Telescope System Instrumentation program), and by Gordon and Betty Moore.